This is obviously a recapitulation of Barker's previous work, and so one can only expect that she would take some things for granted that she otherwise might not. Even so, the student of Judaism and/or Christianity can hardly be expected to take Barker's claims seriously from reading this book. There is no apparent method to the madness. Barker succeeds in culling together handfuls of obscure traditions from across great distance and time, and from disparate communities, harmonizing them in highly dubitable ways. This book contains no sustained exegesis of an entire book or passage and a glance at her bibliography confirms the suspicion that it is an extended exercise in what can appropriately be called "cherry-picking." On that point, why, pray tell, in a book largely about Christian origins, does the Quran have more citations than Acts or most of the other books of the NT? Why does Justin Martyr claim 6 citations, while none of the Pastoral Epistles appear at all? Briefly put, there are no apparent historiographical controls operative in her selection and use of primary sources.Additionally, Barker doesn't let her readers know that virtually every major point in her historical reconstruction of Judaism and Christianity is highly controversial; to the untrained eye, Barker's claims may seem innocent enough–she writes very confidently–but many of her most important claims are completely idiosyncratic. Of course, that doesn't make her wrong, but readers should be aware of such things.With that said, some of Barker's work is valuable. First, the Temple(s) has been a greatly under-appreciated component of Jewish and Christian history and literature; Barker does us all a favor by drawing attention to it once again. Second, Barker has taken seriously the fact that both Judaism and Christianity, from their very beginnings, were diverse movements, and that features of each that we have often taken to be "orthodox" or "normative" were not always so. Third, Barker has also taken seriously the cosmology/angelology/demonology/etc. of early Jewish and Christian literature, things which must receive more attention in biblical scholarship (see also the works of Michael Heiser), especially the influence of Enochic literature on Jesus and the NT authors. There are other arguments in this book that deserve more attention, and could prove fruitful if pursued in earnest; the argument attempting to connect Asherah with Lady Wisdom and the woman giving birth in Revelation, for example, is intriguing. Perhaps "intriguing" is the most appropriate, if not charitable, label to apply to Barker's work, both in Temple Theology and elsewhere. If only she would work more systematically, and within more strict historiographical constraints, there would certainly be greater results. This is the essential starting point to understand Barker's biblical theology as most of her other books are somewhat hard going, packed as they are with a vast amount of detail and academic references. However, her almost re-writing of our understanding of both the Old Testament and the early Christian Church is phenomenal and has me convinced. It shows how Christianity developed, not from some set of ethical teachings distorted by Greek paganism, but from a suppressed Judaism dating from the First Temple times. It may explain, though I can't remember if Dr Barker actually says this, why "the Jews" are the enemy, especially in John's gospel when all the players are "Jews". On this view, there must have been a clear distinction between the followers of the " old" religion and the developing Rabbinic Judaism. It also offers an explanation for many of the differing accounts and plain contradictions of so much in the Old Testament, eg the insistence in the Deuteronomic books that God cannot be seen against the many examples of people seeing God and the longing for the vision of God. My main caveat, especially if you go on to tackle some of her other books, is not to be put off by the implication, a little too strong at times, that the understanding of the first Christians about Jesus was their simply applying the ancient Temple myth to him rather than he being, as C S Lewis said, Myth become fact. 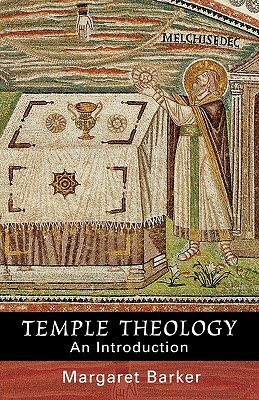 Temple Theology is a short book, but is packed with information. I picked it up because I read about Barker's research on a few LDS blogs, and I was curious what it was all about. Barker is an independent biblical scholar. Her research, at least in this book, focuses on the importance of the temple in early Christian worship. Temple Theology is divided into four sections: Creation, Covenant, Atonement, and Wisdom. I personally found the sections on creation and atonement to be more interesting and insightful than the sections on the covenant and Wisdom, but that is probably due to my LDS perspective and limited background when it comes to biblical scholarship. (I don't know Hebrew or Greek.) A lot of what Barker wrote was a bit over my head, but there were several places in the book where Barker described something about early Christian temple worship that fit quite well with LDS doctrine. (For example: Jesus is the LORD of the Old Testament.) There were even a couple of spots where I felt I was enlightened about some of the symbolism that can be found in LDS temples today.Interesting, but definitely not for light reading. This book is very interesting for those interested in the ancient history of temples. But it is tough book to read if you have not read much of this scholarship before. She does not assume you are new to this topic and jumps right in to give a summary of the research. Several interesting topics include evidence that early Christian worship was centered around temple traditions. Evidence of two streams of Jewish tradition one of which dominated the Old Testament since the "Deuteronomists" major reforms beginning in the reign of King Josiah. In this tradition Moses, the Exodus, the Aaronic Priesthood and a focus on the law and obedience were emphasized, the feminine divine was excised and temple worship was centralized to Jerusalem. The other stream based on Abraham, Melchizedek, Isaac and Jacob with its greater focus on interactions with God was de-emphasized or shunned. Her argument that is that when Jesus began to teach, the reasons his teachings spread so quickly and powerfully among the people is that his message appealed to those that still felt drawn to perspective of greater personal spirituality rather than a primary focus on obedience to the law. For me the last chapter on Wisdom was completely worth plowing through the dense parts -- here she explained how the worship of the divine feminine was probably lost in the purge and the symbols that represent her that can still be seen. This is a fascinating little book with a very different approach to understanding the nature of temple worship during the period of the first temple in Jerusalem--Solomon's temple. Traditionally, Josiah's reforms are understood as a purging of idolatrous practices. Barker proposes that the reforms represented the death knell of the original (and true) temple worship. The author demonstrates that the early Christians had and understanding of the ancient temple worship that had been corrupted and replaced.This study presents the ancient temple through the concepts of creation, covenant, atonement, and wisdom. Her association of the creation with the temple and some of her thoughts regarding Melchizedek and the High Priesthood will be of interest to LDS readers. Barker is an independent Biblical scholar and her point of view is guaranteed to sometimes resonate with sometimes irritate readers. One of the best books I have ever read. I picked this up after reading a few of Barker's papers online. The book is short so I didn't know if it would add much but it gave a much clearer overall picture of Barker's thesis. The book is a broad overview so it helps to already be familiar with some of the biblical issues she discusses. Barker uses a wide variety of sources to make her points, showing her ideas have a large base of support in ancient sources. Her thinking and drawing together of so many texts is what makes the book so interesting in my opinion. It's a brief book, yes, it's an introduction as the title suggests. The book ends a bit abruptly, but I did enjoy myself reading her research. I think Barker has done some great work showing how the temple is rooted deeply within the New Testament and Christianity. Her work has caused much much discussion along these lines and I think it is something that anyone who values Christianity should be aware of. You don't have to agree with all of her conclusions, of course, but the book is worth the read. I'll keep my copy an will be sure to reference it from time to time in my studies. Margaret Barker is a British Methodist minister/scholar who finds two very different Judaisms when comparing the period of the first temple (Solomon's) and the post-exilic temple (Herod's). Her research is fascinating! Mormons will feel right at home reading about the ancient expectation of the Messiah as one after the order of Melchizedek, the great high priest. They will recognize references to the Tree of Life and Wisdom, the Heavenly Queen. The list goes on. Highly recommended! Fascinating book. Dr. Barker caused me to look at the Old Testament in a wholly new light, and the more I read, the more I can see how Ancient Christianity (i.e., the Catholic and Orthodox) are truly heirs to the traditions of Solomon's Temple. I also highly recommend her Temple Mysticism. Disappointing by Barker standards, but laid out in an accessible fashion. Read this one before her other works or not at all. This has a lot of references to modern LDS Temples. Very interesting read since the author is a Methodist. A brief one volume introduction to her work. It consists of a 2004 overview of her work, and chapters on Covenant, Creation, Atonement, and Wisdom. Concise, clear, and insightful. While I don't agree with all of the reasoning in this book, I found it a fascinating study and I learned a lot. I liked her stuff on Mary... some of this was really good. On page 91 she writes:The Lady’s tree of fire appears in another story, where her demise is the preface to the story of Moses and the Exodus. The burning bush was her tree of fire. The story of Moses learning the new name for God at the burning bush is recognised by scholars as the point at which the compilers of the Pentateuch joined together the two traditions. Abraham, Melchizedek and the patriarchs were joined to Moses and the Exodus, and the God of the Patriarchs was renamed. At the burning bush a voice said that the name to be used in future was yhwh (Exod.3.15). Later, we read: ‘God said to Moses: I am the LORD. I appeared to Abraham, to Isaac and to Jacob as El Shaddai, but by my name the LORD I did not make myself known to them’ (Exod.6.3). Ezekiel had described the voice of the Living One as the voice of Shaddai. Now Shaddai has been translated in various ways, most often by Almighty, but the usual meaning of this Hebrew word is breasts, suggesting that El Shaddai had a female aspect. In the stories of the patriarchs, El Shaddai was associated with the gift of fertility: ‘May El Shaddai bless you and make you fruitful and multiply you’ (Gen.28.3); ‘I am El Shaddai; be fruitful and multiply… kings shall spring from you’ (Gen.35.11); ‘El Shaddai… who will bless you with the blessings of the breast and of the womb…’ (Gen.49.25). If the story of the burning bush does represent the transition from the older religion to that of the Deuteronomists, then we should have an explanation for the later Christian custom of representing Mary by the burning bush. This fiery tree had been the ancient symbol of the Mother of the LORD; sometimes Mary is depicted literally within the burning bush, sometimes there is simply a fiery tree named ‘the Mother of God’, and sometimes the burning bush ikon depicts Mother and Son surrounded by the angels of the weathers, that is, the angels of Day One in the Holy of Holies.I'm all, okay Margaret, this is good stuff. I had not equated El Shaddai with the holy mother, the consort of El Elyon, or Elohim. Good call.Later on page 93 she writes:The Lady was never really lost. Throughout the Bible and related texts, there is a whole network of symbolism through which the characteristic Wisdom theology was transmitted. Much of this is now more familiar as imagery associated with Mary. It appears, for example, in Akathist Hymn, where Mary is described as the Queen and Mother, the fiery throne, the dwelling place of the light, the lampstand, the fiery chariot of the Word, the food that replaced the manna, the tree of glorious fruit from which believers are nourished, the scent of Christ’s fragrance, and the unburned Bush. The roots of all this imagery lie in the first temple, which had been the house of Wisdom, the Queen of Heaven, the Mother of the LORD. In view of her importance, it is not surprising that the great churches were dedicated to the Holy Wisdom.Probably my favorite part of her book was her take on Mary and the creation of the veil during her early years as it applies to Hebrews 10 and Christ's body being symbolized in the actual veil in the temple that separated the Holy of Holies from the Holy Place.She writes:The association of the veil and incarnation is set out in the greatest detail in the Infancy Gospel of James, an early Christian text which depicts Mary as one of the young women chosen to weave the new temple veil. She was given the purple and red wool to spin, and as she was working, the angel spoke to her. Thus she was making the new temple veil while she was pregnant. (The angel speaking to Mary as she was spinning became the icon of the Annunciation.) It is possible that this was just an early legend, linking the incarnation and the veil, but, given that Herod was refurbishing the temple at that time, it is entirely possible that Mary had been a temple weaver working on the new veil.Resurrection as a TheosisOn page 23, Margaret Barker talks about the resurrection and how early Christians viewed it... she writes:In temple theology, resurrection was not a post mortem experience. It was theosis, the transformation of a human being into a divine being - which came with the gift of Wisdom; and theosis, described in various ways, was at the heart of temple tradition, together with the belief in a resurrected anointed one, a resurrected Messiah. The Christians thought of themselves as angels on earth; Jesus had exhorted them to become sons of light (John 12:36; see also Eph. 5:8 'walk as children of light'), Paul reminded the Thessalonians that they were all sons of light (1 Thess. 5:5)...I will say that Margaret Barker does not seem to be a big fan of Second Temple Judaism. I will have to read more of her work to get a better feel and read on this issue, but Josiah's reforms do not seem to sit well with her. I will add that history is written by the victors, and whatever it was that people who followed Asherah were doing before Josiah has been largely stripped from history. I will continue to keep searching down this path and see where it leads. I sat down and read this whole book in one sitting! I found it fascinating and interesting that a methodist preacher, through her scholarly biblical studies, has tried to reconstruct the temple and its significance to Christian theology. And how her studies have led her to reject mainstream "Christianity" ideals such as the concept of the trinity, atonement, and a heavenly mother. The Nicean creed was what established a common belief of what Christianity is known today, but when Barker really tried to understand Christianity the way it was practiced and meant to be preached, she realized these were false ideas and (in a very complicated way) tried to explain how her findings hold some sort of substance or credit. This book is not for the light reader, it is an intense read - one which the author doesn't take time to explain things and assumes that you already have a prior knowledge of what she is talking about. It feels more like a lecture, or lecture notes, than a work of non-fiction. And there were a few times where I felt like something was "missing" it lacked just something, some sort of proof, or it wasn't very cohesive in the way she was trying to tie everything together - and I think that her section on "Wisdom" was a stretch (for me). All in all, I found it quite fascinating and very interesting and would have to say I agree with most of her ideas. One I want to explore further is the idea of Dueteronomists (Law of Moses) vs. Abrahamic Law... or old vs. new... or 1st temple vs. 2nd temple ideas. I really think that this would explain why there are so many discrepancies in our Bible and why certain books are referenced but have been removed and we have no canonization of them. Love the insights brought to light by Margaret Barker in this small volume. I'm a fan of her work and insights about the lost temple theology in the scriptures and some of the reasons historically. Highly recommend this very accessible little volume. This is th3 essential Margaret Barker on Temple Theology. I recommend this book to anyone interested in temples or early Christianity. The first few chapters were magnificent, and I gained some incredible insights (most particularly on several key words' translations, and the contexts in which they were used, e.g. "hosanna"). I was also beyond excited to learn about the physical bent that the Deuteronomist had, while the Chronicler had a sensitive appreciation for the metaphysical and the mythical. I suspect that my reception of this book was so warm because I've read so little about early Christianity and the compilation of the Bible; so much of the information was new to me. At some points Barker was redundant and regurgitated information with which even as a casual reader I was familiar. I'm curious to study more early Christianity to see how her thesis fits within the academic landscape.This would have gotten five stars, but the last chapter on Wisdom is weak and ties Wisdom to Mary/The Mother of God. Barker makes such an unimaginative claim there. She also does not wrap up the book; it ends with the Wisdom chapter. During the first 20 or so pages, I thought her insights were akin to those given by C.S Lewis. Though I am greatly affected by Barker's ideas, I have since altered my opinion of how close she and Lewis are. I was introduced to the work of Margaret Barker by an acquaintance of mine​. This book will blow your mind, which is not always a good thing. While I was already somewhat familiar with second temple literature, Margaret Barker introduces a new way to interpret that literature, demonstrating that the New Testament comes from the same source, while the Hebrew Scriptures are the product of an alternate strain of Judaism, one that reinterpreted Judaism, eliminated the hereditary Aaronic priesthood, and used the authority of the temple to suppress their enemies. This does not mean the second temple literature is inspired, nor does it mean the Old Testament is not inspired. Nevertheless, the art of biblical interpretation is more complex that it is often made out to be. Those who argue for a grammatical-historical hermeneutic are generally either ignorant of much of this history, or reject it out of hand. For that reason I do not recommend this book for casual bible students --- without some grounding in the subject, it would be easy to lose your faith. Author is Methodist. Univ of Cambridge. Basic thesis is that temple worship illuminates new testament but that temple roots of atonement have been neglected in modern Christian teaching. She uses canonized biblical references and a number of more recently discovered texts to support a view that authentic Christianity was rooted in temple worship. Her research supports the temple focus of Mormons and highlights what appears to be a gap in the worship of the balance of the Christian world. This was a very interesting book, even if it was short on explanation. I read a lot of stuff related to LDS, Catholic, and Anglican theology and liturgy so I could see some connections that could be made. I may read more of her work to see if she gives more insight on these connections.Overall this was a good, but heavy, book about a little discussed topic. Reading Barker's little gem of a book, I found myself elevated and illuminated. Ideas came together for me that I hadn't ever considered. While sometimes the details of Biblical scholarship were outside of my experience, I had no problem following the thesis. My paradigms are shifting. Reading this book left me with a feeling of hope and light. This book was eye-opening and mind-expanding. I loved understanding more connections between ancient temple worship, the creation, the veil, eternity, and the Old and New Testament from this Methodist scholar. It helped me understand and approach my own temple worship with new insights and understanding. I'm excited to read the author's more recent book as well. My theology is tingling...Margaret Barker is a Bible scholar who isn't afraid to inform you that everything you knew about the Bible is sort of shallow and wrong. Like read-it-again wrong.Any Mormons reading this will scratch their heads and wonder if Margaret Barker is Mormon--she's not. Great summary of ideas from many of Margaret Barker's earlier books. Suggests that an older Hebrew religion centered on temple theology prepared Jews of the 1st cent. to accept Jesus's claim to be the Son of God. Very dense writing: I underline or write in margins on every page. At times deep, often insightful, sometimes over my head. kind of a summary. Didn't really see the point behind it.